As laptops get skinnier and flat screens get flatter, cell phones become smarter and game consoles become multipurpose entertainment-networking-exercise machines (if you’ve used a Wii, you understand), millions upon millions of old electronic gadgets end up buried in desk drawers, gathering dust in the garage or, worse, buried in landfills or burned in incinerators. With toxic materials such as lead, mercury, hexavalent chromium and the like, where should our e-waste go? Fortunately, forward-thinking environmental advocates, corporations and policy-makers have worked to implement producer takeback recycling programs for obsolete e-waste. 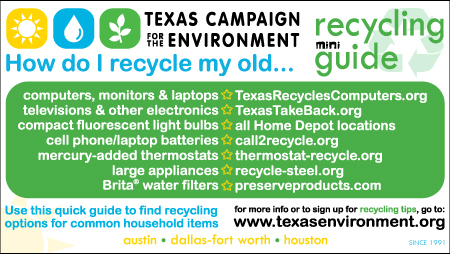 In essence, takeback recycling means that manufacturers offer convenient recycling options for their old products—you can learn more than you ever wanted to know at www.TexasTakeBack.org. Although the instructions for responsible disposal of non-working compact fluorescent light bulbs (CFLs) tell you to simply wrap the bulb in a plastic bag and throw it in the trash, don’t. Instead, take your spent CFLs to any Home Depot location, where the toxic bulbs will meet a safer end. In the Metroplex, Universal Recycling Technologies will recycle your old fluorescent bulbs and tubes and currently partners with some municipal household hazardous waste programs. Check with your city for details. Note: the amount of mercury pollution prevented by saving energy—often produced by coal-fired power plants, which emit mercury into the atmosphere—is greater than the amount of mercury in CFLs. Thus, you should undoubtedly continue to utilize energy efficient lighting…just make sure you don’t follow the instructions and recycle responsibly instead. How old is your cell phone? How long until you get a new one? Precisely. Outside of the toxic materials you find in most e-waste, your cell phone or laptop batteries also contain potentially harmful metals such as nickel, cadmium, lithium or zinc, among others. Luckily, these are also valuable metals, so recycling markets are strong. With 150 million cell phones alone becoming obsolete annually, all those rechargeable batteries could produce a mountain of trash—or a mountain of treasure. Choose. You can go to www.call2recycle.org to view the free recycling options offered by the non-profit Rechargeable Battery Recycling Corporation. As many households switch to sleek new programmable thermostats (a good move for energy efficiency mavens), it’s important to make sure that you—or your contractor—know that recycling the old bulky thermostat will help prevent mercury from entering our landfills. The Thermostat Recycling Corporation, started by leaders in the thermostat industry, facilitates programs across Texas and the U.S. Since old thermostats contain among the highest mercury content of household items, recycling is a must. Find details at www.thermostat-recycle.org. Every year, Americans dispose of over 100 billion single-use plastic checkout bags, each of which takes as many as a thousand years to biodegrade. The amount of petroleum used to manufacture these disposable bags could fuel an average car for over 680,000 miles. Worse yet, they cost us money: some reports estimate that each plastic bag costs taxpayers 17 cents for pick up and disposal. Grocery stores such as Whole Foods have banned plastic bags altogether and Wal-Mart has pledged to reduce bag use by one-third by 2013. Other large grocery chains have also implemented plastic bag recycling programs. Although many of the programs you’ll see at www.plasticbagrecycling.org don’t go far enough, U.S. retailers are beginning to change their wasteful ways. The list of large household appliances, also known as “white goods” (because they’re often white…creative, no?) consists of washers and dryers, stoves, air conditioners, dishwashers, refrigerators, freezers and water heaters. Because large appliances are usually made of steel, recyclers want to get their hands on your white goods. 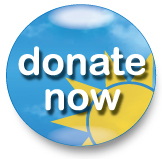 Click on the “Steel Recycling Locator” at www.recycle-steel.org to find a recycler near you. A word of caution: refrigerants such as freon must be removed by a certified technician prior to recycling, so make sure you read the directions provided by the recycler before you lug your fridge halfway across town. Additionally, many cities now offer this service at no charge. Turn your used water filters into toothbrushes. Really. A company called Preserve, will take your old Brita® filters—made mostly of number 5 plastic—and remanufacture them into razors, cutting boards, bowls, cups and, yes, toothbrushes. At www.preserveproducts.com/recycling, you can find drop-off locations for Brita® brand water filters. Note: unfortunately, Preserve doesn’t accept other branded filters at this time. Oh, Styrofoam…thou art a dunghill villain and a petrol-fed knave…or words to that effect. Elizabethan insults aside, polystyrene is petroleum-based, contains potentially carcinogenic components and takes eons to biodegrade. Currently, recycling markets for polystyrene are extremely limited, so using less—or none at all!—is the best policy, with one exception: if you get a package with polystyrene peanuts, take them to a packing store such as FedEx or UPS. These folks love free product…and you’ll love keeping those plastic non-legumes out of the landfill. I support your efforts, but I like to use plastic bags for kitty litter and my garbage. Does it really cost much for recyclers? Is it really that much trouble? Can’t we have disposable bags? Why don’t we have single stream recycling at apartments? And composting? Shouldn’t the city and schools have a sustained campaign to inform the public? Shouldn’t there be a deposit on batteries? Who do we contact? Who is responsible? What is the best way to make our voice heard? I’m a bit apathetic because I don’t know who to contact who will listen, and what I can do to make changes. You site is fairly good, but could be improved with videos, and stories of effective campaigns. I also wonder why we don’t have trash burners like they do in Europe. And can’t waste from factory farms be put to better use making methane gas and fertilizer? I too use plastic bags for dog walks and trash cans, but that doesn’t mean every single trip to any and every store should result in disposable plastic bags. We use/throw away far too many of them, plain and simple, and we need to take concrete steps to reduce their prevalence in our daily lives. Your questions and suggestions are terrific. We do need more waste reduction and recycling efforts in all settings. The best way to make your voice heard depends on where you live. Different places have different recycling ordinances. You can contact your mayor and city council, or your homeowners association, or your condo/apartment management or landlord. Let us know your situation and we can give you more specific suggestions. Trash incineration isn’t a good idea, because more energy can be saved by recycling than can be created by burning waste — and incineration puts toxic pollution in our air and water. Farm waste can be used for methane production, although its usefulness as fertilizer depends on what the animals are being fed/injected with.